I find myself feeling frustrated, worn down, and at times angry about this federal election that’s thankfully coming to an end on Monday. As a progressive voter, I’ve been disappointed by Thomas Mulcair and the New Democrats, for reasons that Desmond Cole explains so very well in today’s Toronto Star. (Locally, I ‘ve been supporting the NDP’s Linda McQuaig in Toronto Centre, whose progressive credentials are impeccable.) The bright side is that Stephen Harper’s Conservatives are going down to an almost-certain defeat, hopefully taking their narrow and divisive targeted politics with them. My wish is for a minority government in which the Liberals and New Democrats share power; this may check the Liberals’ record of running left and governing right. Happily, Torontonians also have the Blue Jays and municipal politics to watch. 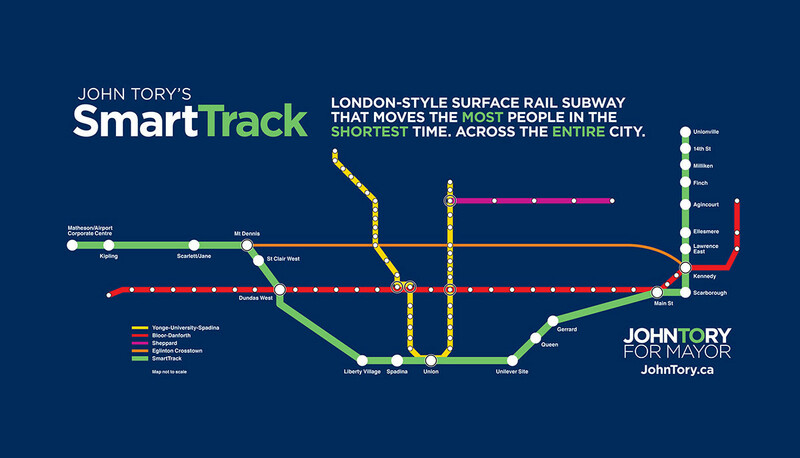 Last night, we all got to watch the strangest seventh inning in baseball history; today, we get to snicker at the efforts of an Astroturfing crew of lobbyists pushing SmartTrack – a mayoral campaign slogan masquerading as a transit plan. Municipal politics may be at times just as depressing as provincial or federal politics, but at least it’s a lot more fun. 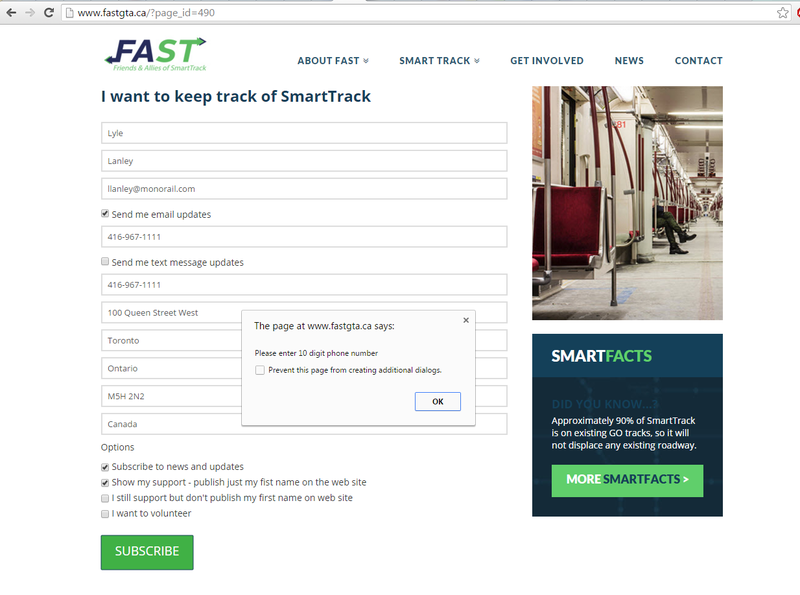 The Toronto Star’s fantastic transportation reporter, Tess Kalinowski, reported on a new booster group, known as FAST (Friends & Allies of SmartTrack). Its spokesperson would be Alvin Curling, a former provincial Liberal cabinet minister and Speaker of the Provincial Parliament. Other members of its Public Advisory Board include Kyle Rae, former city councillor who is now a City Hall lobbyist, and three prominent lawyers – Andrea Geddes Poole, Michael Brooks, and David S. Young. Also involved is one Tom Allison. FAST’s website – launched today – is comically full of spelling and syntax errors, misinformation, and complete fabrications of basic facts. Here are just a few. 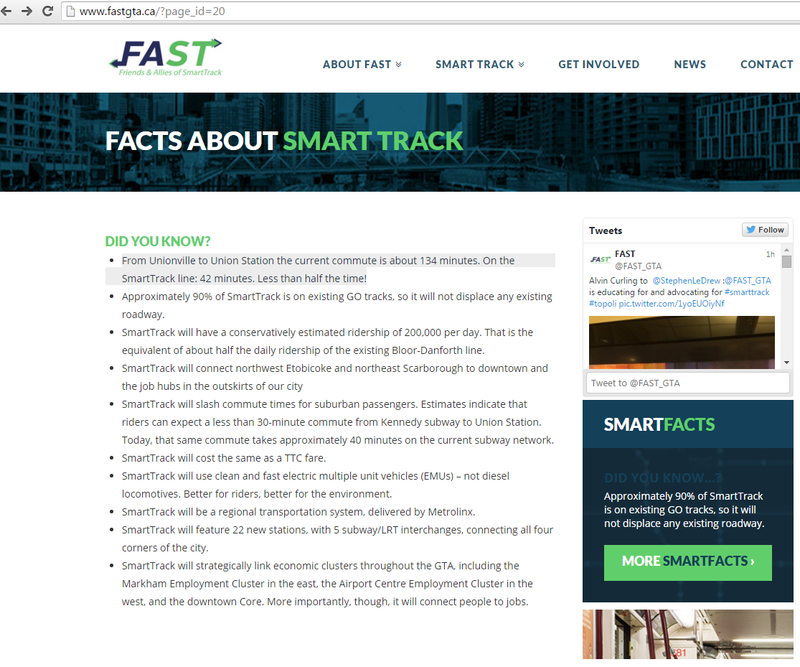 In “Facts About SmartTrack” (screenshot saved here), there are a number of questionable statements. This is false. GO Transit’s own commuter rail service from Unionville to Union Station travels this distance in less than 50 minutes. Smaller, faster trains might reduce this commute slightly, but additional station stops might also negate any time savings. This is, at best, speculation. The eighth point reads that “SmartTrack will be a regional transportation system, delivered by Metrolinx.” Metrolinx is indeed examining regional transit fare integration, but is most enthusiastic about distance-based fares, possibly even premium fares for higher-order transit, similar to the fare scheme already in place by GO Transit. With Metrolinx responsible for SmartTrack, fare integration with TTC subways , streetcars and buses, at least in the way we know it, is far from guaranteed. Again, these claims are questionable, especially as SmartTrack hasn’t yet evolved from a line on a map from John Tory’s election campaign. The problems with the western section of SmartTrack, between Mount Dennis and the Airport Corporate Centre in Mississauga, are well-documented. The Richview transportation corridor was largely sold-off by the municipal government; any connection between the Metrolinx UP Express/Kitchener GO corridor and the proposed line will be problematic. There are acknowledgements that this will pose a problem elsewhere on the site, including the final FAQ. In the SmartTrack Principles page it is claimed that “analysts believe SmartTrack’s operating costs can be covered by fares from Day 1” – a rather dubious claim that no public transit operation in North America has a 100% fare recovery ratio, and expecting such a feat on Day 1 is ridiculous. Subsidies for transit operations are the norm, and there is nothing wrong about that. 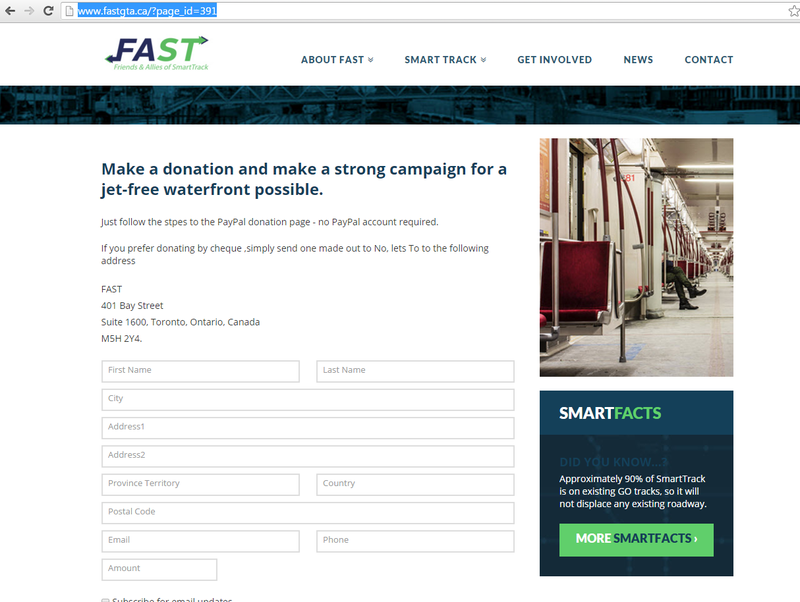 The “Donate” page asks visitors to “make a donation and make a strong campaign for a jet-free waterfront possible.” And “if you prefer donating by cheque, simply send one made out to No, lets To…” (Screenshot saved here) Was this a lazy cut-and-paste from No Jets TO’s website? The “Subscribe” page requires two phone number entries, does not recognize brackets (for area codes) or even dashes in phone numbers, nor does it recognize Canadian postal codes, requiring a US zip code. Once I entered Lyle’s zipcode as 90210 (the most famous zip code thanks to 1990s television), I was finally successful. In the Frequently Asked Questions, under “What route would it take?” the link to a map goes to “John Tory’s SmartTracker” – a website created for John Tory’s mayoral campaign in 2014. SmartTracker itself remains full of errors; it also shows how little relief the route will actually bring to the at-capacity Yonge Subway. I’m not sure what a “fist name” is, and I’m not sure if I want to know. Updated: Councillor Gord Perks posted part of the minutes from the April 22, 2015 Toronto Financial Group BIA meeting on Twitter. We learn that SRRA, the group that originally created SmartTrack, presented to the BIA; it is involved in reviewing SmartTrack (where an independent firm would probably be more appropriate). The minutes also include a summary of a visit from John Duffy and Amber Crawford, of city hall lobbyists Strategy Corp. to discuss FAST. John Duffy was Tory’s campaign policy chair; in May, Duffy and fellow Tory campaigner Nick Kouvalis were hired by Uber to lobby councillors at Toronto City Hall. Duffy seemed concerned that political interference (read: public input) would “water down” SmartTrack; he seemed especially concerned in “…ensuring the plan is implemented as it is envisioned, supporting transit-oriented developments and ensuring that it is not eroded into local service.” The TTC’s subway is so successful (and why real relief is necessary) because it relies on local service feeding the system; local stops guide development and ensure high accessibility. The Yonge and Bloor-Danforth subways were built along existing transit corridors, replacing overloaded streetcars and buses. It seems that FAST’s top-down advocacy seeks to minimize objections by the public and even other transit and urban experts by pushing this scheme as quickly as possible. Today’s launch of FAST reeks of incompetence, and I snickered many times reading this website. But there are major concerns raised by the establishment of FAST. Why does an un-evaluated transit plan, albeit one with support from all three federal parties, need lobbyists to support it, especially if it was one advocated by the sitting mayor? Why is there a link to a John Tory for Mayor campaign website, if FAST’s press release states that the mayor “will not be consulted or have any direct involvement”? Why should a lobby group ask for non-refundable donations? Why is former provincial Liberal strategist and John Tory campaign manager Tom Allison involved, and what interests is he and the other lobbyists representing? I could also ask why SmartTrack, which remains a dubious proposal with minimal planning behind it, has become such a political priority over other much needed transit projects (like the Relief Line Subway), but sadly, I won’t get a satisfying answer to that one. At least I had some fun tracking the inaccuracies and mistakes that this Astroturf group started out with. Why do a handful of lobbyists, with close connections to the mayor, have so much influence over Toronto’s transportation future? Maybe I should start a counter-lobby group. Maybe I’ll call it STRIKE: SmartTrack Rationale Ignores Knowledge and Evidence. Who’d donate to that? This entry was posted in Politics, Toronto, Transit and tagged John Tory, Metrolinx, SmartTrack, Transit. Bookmark the permalink.